9 out of 10 organizations aren’t as protected from cybercrime as they think they are. Most companies just assume their IT department keeps things under control. Or perhaps they think cyber thieves wouldn’t target them because they’re a small organization. Unfortunately, this is not the case. Small organizations are big targets for cyber hackers and thieves. 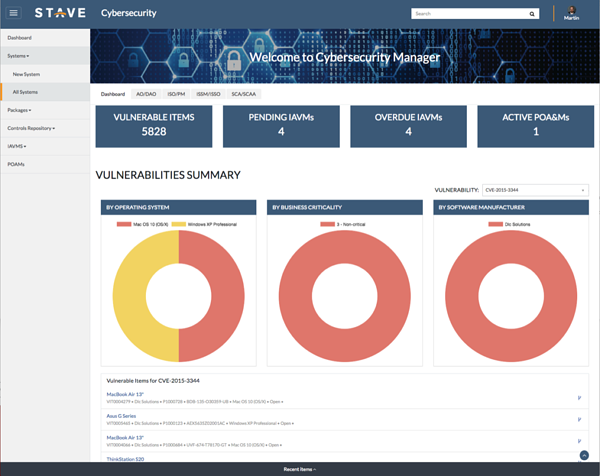 Stave Cybersecurity Manager allows organizations to see the vulnerabilities in companies’ IT infrastructure almost instantly— and it isn’t unusual to discover 5,000 (or more) open vulnerabilities that put your organization at risk. Don’t let the headlines fool you. Most cyber attacks don’t happen to big businesses like Target and Equifax— those just get the most news coverage. Most victims are small and mid-sized organizations that struggle to survive the attack. 90% of small businesses don’t actually protect customers’ personal information from thieves, even if they have some security in place. 61% of cyber attacks happened to small businesses last year. That’s up from 53% the year before. The average cyber attack costs a business between $84,000 and $148,000 per incident. 60% of small businesses go out of business within 6 months of an attack due to the financial strain. There are many reasons why a company might be exposed to cyber threats. Outdated software and poor security protocols are some of the main culprits. Do you hold regular security training meetings and require that your employees follow certain data security procedures? Bad habits are the #1 threat to cybersecurity. These bad habits can include using default passwords, sharing sensitive administrator information, not performing security updates and patching, and a general lack of visibility into your current security posture. In-house IT staff are often unintentionally be part of the problem; they’re too busy with a wide variety of tech support needs. As they manage the day-to-day IT issues, they may become too overwhelmed to stay on top of new vulnerabilities and the delayed, yet required, updates and patches. Old-fashioned processes that lack automation and integrated configuration visibility also prevent your cyber security staff from using the most modern methods to manage configurations and baselines. It only takes a short time for hackers to do enormous damage. In fact, 88% of data thieves can target a company and infiltrate it within 12 hours. What can Stave Cybersecurity Manager Do for You? Stave Cybersecurity Manager is a digital platform that helps ensure Continuous Monitoring of your systems - it integrates with your Configuration Management Database (CMDB), Vulnerability Detection systems, and monitoring tools to aggregate vulnerability and security posture information. It’s like a watchdog for your data, barking when it suspects something is wrong. Cybersecurity Manager doesn’t just trigger alerts - it provides task-based step-by-step plan of actions and milestones (POA&M) to ensure vulnerabilities are identified, resolved, and prevented. It offers a dashboard of real-time information, plus reports that illuminate your security posture. Take a look at the image below. It shows a Vulnerabilities Summary generated by Cybersecurity Manager. In the first blue box, see the number 5828? That’s the number of vulnerabilities identified on this organization’s networks - more than 5,000 individual holes where a cyber criminal could attached the organization. Armed with the knowledge given them by the information shown in the Vulnerabilities Summary above, this organization was able to address their security vulnerabilities. They ensured continuous monitoring of their security posture as new vulnerabilities are identified. To learn more about this fascinating process, watch this short Stave video about cybersecurity. Ready to use Stave Cybersecurity Manager to manage your organization’s vulnerabilities? Connect with Stave or go try it out in the ServiceNow Store.